"If Blizzard added your main as an NPC in WoW, where would they be located and what would be their function? Give us a shot illustrating the fact." Of course, my first thought was "which main?" There's my old main, Quintalan, basking in retirement, and my current pair of mains, Tomakan (Alliance) and Nevelanthana (Horde), who will soon be retiring once Mists drops. I haven't decided on a new main, but Adelwulf is probably in the mix. Then I remembered how we used to handle our characters in the old AD&D games I played my first time around as an RPGer. Once a character amassed enough wealth and/or power, we had the character merely 'retire' to live out the rest of life as the lord of some castle-or-other. Essentially, our characters became NPCs in the game world. So I was already doing to my WoW characters what I'd done all that time ago: making them de facto NPCs. Therefore, I'm going to take a look at each of my already retired or soon-to-be-retired mains and see what they'd be up to. Mu'ru is gone, his spark used to re-ignite the Sunwell. The Blood Knights loyal to Liadrin, Lor'themar, and Halduron Brightwing fought and defeated Kil'Jaeden as part of the Shattered Sun Offensive. Many went on to lend support to the Argent Crusade in the struggle against Arthas. 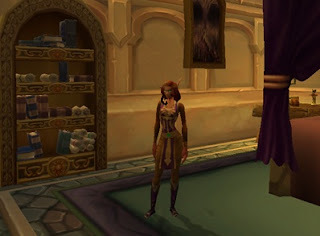 Lady Liadrin now resides at the Sunwell, speaking to pilgrims from all over. Therefore, it falls to the veterans of the Blood Knights, such as Quintalan, to indoctrinate the new initiates into the fold. Initially, he is found alone, looking at the Shrine of Dath'remar on Sunstrider Isle. Does anybody ever read the plaque here? Later, he wanders between Fairbreeze Village, Tranquillien in the Ghostlands, and the Farstrider enclaves in both Eversong and the Ghostlands. 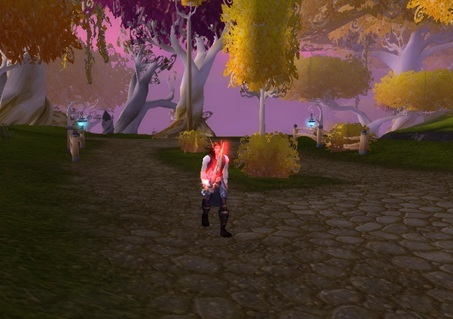 Eversong is a beautiful and pleasant place. Pay no attention to that Dead Scar over Q's left shoulder. He gives Blood Knights quests at L20 and L40 on the history of the Order. Upon completion of the L40 quest, the Blood Knight opens an additional quest in which Quintalan presents the Blood Knight to Lady Liadrin at a phased version of the Sunwell. The Lady gives her approval to accept the Blood Knight as a squire of the Order, and sends the new squire on a quest chain for the purpose of atoning for the misdeeds of the fallen Blood Knights. 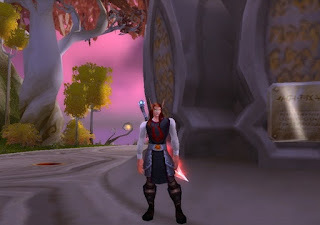 At the completion of the quest chain (and at >= L60), the Blood Knight receives a message to seek Quintalan out, and he initiates a special chain which takes the Blood Knight to the Sunwell for a presentation before A'dal and Liadrin. The latter then gives the Blood Knight the Order's tabard, signalling acceptance as a full Blood Knight. Quintalan's sister was never the one for history. She spends her days between the Isle of Quel'Danas and Dalaran, exploring the Arcane and stretching the boundaries of what it can do. At her room in Dalaran, she is surrounded by her beloved books of Arcana and the mages whose order she longed to join as a youth. The post-Kil'Jaeden Quel'Danas is a hive of activity and optimism as Sindorei and Queldorei work to rebuild and cleanse the place of the demonic taint. She refuses to get involved in factional politics, but Arcane arguments are a different matter. my books are coming with me! 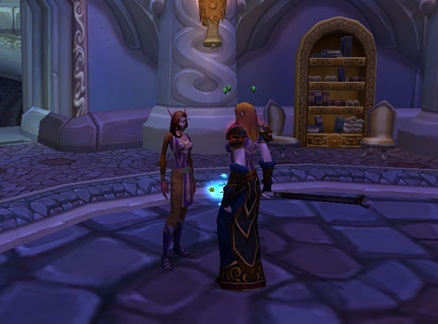 In Dalaran, Neve begins a Mage quest chain that ends in the Mage learning how to port to both Quel'Danas and Wyrmrest Temple. A final quest explores the possibility of a portal to Coldarra, yet in the end she concludes that "the ley lines surrounding the Nexus have yet to completely stabilize, rendering a portal unusable for the time being." difficult to get a portal open to the Sunwell! A Draenei who sincerely believes in the words "be kind to those less fortunate", Tomakan has seen everything the length and breadth of Azeroth. To him, the greatest danger to the world doesn't reside in what's left of Twilight's Hammer, or even the Horde, but in one of Azeroth's most vexing races: Gnomes. The Hand of Argus is firmly convinced that somehow, somewhere, some pint sized engineer wannabee is going to be the person who accidentally opens a portal for the Burning Legion to enter the world. And if he can help it, that fate is not going to happen on his watch. 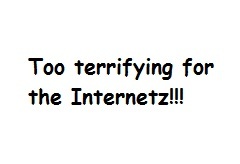 And in Comic Sans, too!! *That trinket's special ability is to stun an enemy by a slap to the head. Those are truly awesome ideas. I'd love to take my BE Paladin through a lore-heavy quest chain like the one for Quintalan, and it'd be great if Mages could port themselves to Quel'Danas and Wyrmrest! Q: [sips drink] They just don't make Blood Knights like they used to. Too many of them are scared at even the mention of Kil'Jaeden. N: As they should be. N: Still trying to get my suite at Magister's Terrace cleaned up. Some Warlock apparently thought it was funny to let their Imp mess the place. To be honest, having done enough Blizz requests, I'd suspect that Tomakan's quests would be the ones that they'd actually do. Some of the quests I most enjoyed were class quests like the Swift Flight Form chain and I seem to remember way back my Hunter going to Azshara and starting a chain. But what I'd really most like Blizzard to do is send Tomakan to watch the Gnomes, it's a dirty job but somebody has to do it. They need watching. Amen to that! My favorite quest line throughout the entire series has been the Blood Knight's Charger/Tabard chain. Yes, it was deeply conflicting, but that's what it was meant to be. And it set the stage for the Order's redemption in Shattrath City. If Tom does watch the gnomes, he'll need a lot of alcohol. I know I would.